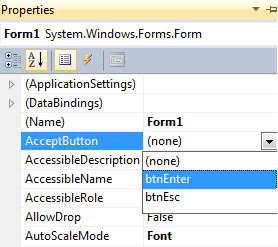 Suppose I have a Windows Form and two buttons name as btnEnter and btnEsc. I want when use click on Enter, btnEnter should respond and similarly when user click on Esc, btnEsc should respond. After that when you open the form, click on Enter key, btnEnter will fire and if you click on Esc, btnEsc code will fire.